Obstructive sleep apnea (OSA) is the most common type of sleep apnea (and it’s the focus of this blog post). The soft tissue in the back of the throat collapses while sleeping, which creates a blocked airway. A blocked airway causes several interruptions in a person’s breathing. Even though the interruptions are brief, they can occur hundreds of times throughout the night. Doesn’t sound healthy or safe, does it? Sleep apnea is never a good thing. It should be accurately diagnosed and effectively treated in a timely manner. If you experience any combination of these symptoms, schedule an appointment with your doctor or dentist. He or she can evaluate your symptoms to determine if further testing is necessary, such as a sleep study (a sleep study will determine if you have sleep apnea). Think sleep apnea isn’t a serious problem? Think again. You may have seen sleep apnea-related commercials on TV or maybe you know someone who has sleep apnea. Is sleep apnea really a problem for these people? Could sleep apnea be a serious issue? Will sleep apnea just go away on its own? We’re here to tell you that sleep apnea is a real problem AND a serious problem. — A person who has untreated sleep apnea gets behind the wheel of a vehicle and can put everyone else’s life in danger. You see, he/she can fall asleep at the wheel, which is never a good thing. — A person who has sleep apnea typically snores and gasps for air at night. His/her bed partner typically will not get a good night’s rest (and no one wants to deal with a cranky, sleep-deprived wife/husband day in and day out). — A mother or father who works full time caring for a newborn or a young child might not have the energy or the patience to be the best mommy or daddy. You see, sleep apnea causes restless nights (in addition to the newborn waking up countless times throughout the night...talk about being sleep deprived!). So you see, sleep apnea can negatively impact you and others around you on a daily basis. Timely treatment is necessary. What is a sleep apnea intraoral appliance? An intraoral appliance is similar in appearance to a mouthguard. It can mitigate or even eliminate the symptoms associated with snoring and sleep apnea. In general, intraoral appliances work by slightly repositioning the jaw to promote easier breathing and less snoring. Many people consider the intraoral appliance as a better treatment, far superior to other sleep apnea devices. Actually, in 1980, the Continuous Positive Airway Pressure (CPAP) device was invented by Collin Sullivan as a treatment for sleep apnea. Many people use the CPAP device to treat sleep apnea. However, with advancements and more research, the intraoral appliance was designed with sleep apnea patients in mind. Most likely, for CPAP users, an intraoral appliance would suit them better (we’ll get into the reasons a bit later). At Shining Smiles Family Dentistry, Dr. Mohip will make sure the sleep apnea mouthguard/intraoral appliance is custom fit to your mouth. This will ensure maximum comfortability and effectiveness. Why is an intraoral appliance one of the best treatment options out there? Why choose a sleep apnea mouthguard versus a CPAP machine? Convenience — you don’t have to lug around a bulky CPAP machine; just slip the appliance in your pocket or purse when traveling. Easy to use — putting the appliance in and out of your mouth is a breeze. No electricity needed — forget about positioning your bed next to an electrical outlet to plug in a CPAP machine…no electricity required for this appliance! Comfort — everyone who uses the lightweight, flexible appliance comments on how comfortable it is to wear while sleeping (you’ll see once you start wearing yours!). What’s next? Call to schedule your appointment. The longer you wait without getting effective treatment, the worse the sleep apnea symptoms can get. It will not go away on its own, so don’t try (no wishful thinking here). Don’t put yourself and others around you in danger; call your dentist or doctor today for an appointment. If you live in or near Powder Springs, GA, we invite you to call Shining Smiles Family Dentistry for sleep apnea treatment. Our dental office offers intraoral appliances to patients with overwhelming success. So don’t suffer from sleep apnea any longer. Call today to schedule your appointment with Dr. Mohip at Shining Smiles Family Dentistry. To learn more about Dr. Shaila Mohip, click here. There’s simply no denying it. Like it or not, your smile is without a doubt one of the first things people notice about you! If you have a great smile, it can lead to a great first impression, which is beneficial in a variety of personal and professional settings. While the reasons to visit your dentist on a routine basis are numerous, one of the most important reasons is to ensure that your gums stay healthy. In fact, did you know that according to a 2010 study from the CDC, roughly 47% of American adults have mild to moderate periodontal disease? That begs the obvious question: what are the early warning signs of periodontal disease, and can they be reversed? In this article, we’re going to share with you a few things you can look for to determine whether or not you may have some form of gum disease. By catching periodontal disease early you’re much more likely to keep it under control. Also, visiting a dental office for your routine cleaning is paramount if you want to keep your mouth healthy and avoid any complex or difficult-to-treat dental issues down the road. First things first: What is periodontal disease? Simply put, periodontal disease (a term often used synonymously with gum disease) is an infection of the structures that surround the teeth, which is primarily the gums, but also includes the periodontal ligament and the alveolar bone (which is the bone structure that contains your tooth sockets). When the areas around your teeth become infected, periodontal disease is the result. The earliest stage of gum disease is called gingivitis, which you’ve probably heard of before. Gingivitis is inflammation of the gums caused by a buildup of plaque. It is one of the early warning signs of gum disease. The reason it is so important to catch periodontal disease at this early state is because gingivitis can be reversed since it hasn’t yet reached the bone or connective tissue. So if you are noticing any signs of gingivitis such as bleeding gums or a buildup of plaque, it’s important to schedule your next dental appointment as soon as possible. If you are in or around the Powder Springs, GA area, then please contact our office at Shining Smiles Family Dentistry to schedule your appointment with Dr. Shaila Mohip. Once you move into the second stage of periodontal disease (known as periodontitis), the damage that has occured to your teeth and gums thus far cannot be reversed. The reason? If your gum disease has reached the point that it can be diagnosed as periodontitis, it means the supporting structures (bones, sockets, etc.) have been impacted. While this sounds like terrible news, it’s not the end of the world. If you have periodontitis you can prevent further damage by adopting a solid oral hygiene routine at home, avoiding certain foods and beverages that damage your teeth and gums, and seeing a dentist every six months. When you see individuals who have severe tooth decay or are missing teeth, they are likely in the advanced stage of periodontitis. At this point, the bone supporting your teeth (and the surrounding structures) are completely destroyed. This means that your teeth can shift and even fall out. At this point, many patients opt for a dental implant restoration, which is a procedure that we perform routinely at our Powder Springs dental practice. Healthy gums are a nice, “comfortable-looking” pink color. If you notice that your gums are an “angry red” color, that could be a possible sign of gum disease. Sure, not everyone’s gums are the exact same color, but if you notice that yours are more red than they have been in the past, it’s time to see a dentist to get evaluated. Contrary to what many people believe, gums bleeding while brushing your teeth isn’t normal. It likely means that you are either in the early stages of gum disease (gingivitis) or you are brushing with way too much force. If you find that your gums constantly bleed while you brush (even after you start brushing a little softer), you should see a dentist immediately. Remember, if caught early enough, gum disease is reversible so it isn’t something you want to wait on to get checked! Mouth sores can be anything from harmless (although very painful) canker sores to very serious illnesses such as mouth cancer. They are also a common symptom of periodontal disease. Bottom line: if you are experiencing any kind of mouth sores, seeing a dentist is a good idea. Again, if you are in Powder Springs or the surrounding area, please give Shining Smiles Family Dentistry a call today to schedule your appointment and get evaluated for gum disease. It isn’t normal for teeth to shift in the mouth. If you find that your teeth are shifting or they fit together differently when you bite down, it could be a sign of periodontal disease. On the other hand, a bite that is “off” is also a common sign of TMJ. So, if you think you may have TMJ, you can visit our page on TMJ by clicking here. If you have teeth that are loose or have fallen out, you could have an advanced form of gum disease called advanced periodontitis. At this point, your gums and the surrounding tissue and bone have been impacted and the damage is irreversible. That being said, there’s still hope and you aren’t without options. At Shining Smiles Family Dentistry, we routinely place dental implants and crowns for patients who have lost some or all of their teeth. You have nothing to be ashamed of and we have a solution that will restore your smile and self-confidence! If you are experiencing any of the early warning signs of periodontal disease, then it’s time to see a dentist in your area. If you are in or around Powder Springs, we hope that you’ll come see Dr. Mohip and the rest of our friendly, caring team of dental professionals at Shining Smiles Family Dentistry! To book your appointment, give our office a call today. There’s no doubt about it; your oral health plays a significant factor in your overall health and wellness. Unfortunately, many people tend to do the bare minimum when it comes to taking care of their teeth and gums, which sometimes doesn’t cut it. In this article, we’re going to share with you 7 reasons why your mouth isn’t healthy and what you can do to combat each of these problems. You’ll be able to smile confidently again knowing that your teeth and gums are in great shape! When you smile, the first thing most people notice is the color of your teeth. While some people’s teeth are a beautiful white color, many people have teeth that are stained a yellowish or brownish color. Because of this they don’t smile as much and tend to be self-conscious of their teeth. While this is certainly a cosmetic issue it’s also a functionality issue. Teeth that are stained yellow or brown can be a sign of tooth decay, which is a problem you don’t want in your mouth. For patients with surface staining, professional, in-office teeth whitening can lighten your teeth several shades in a short amount of time. For more severe problems such as tooth decay, we recommend that you schedule an appointment with Dr. Mohip so that you can have a full oral exam and get recommendations on how to proceed with restoring your teeth. While most people think that crooked teeth is simply a cosmetic or orthodontic issue, it can actually hurt the health of your teeth and gums. Teeth that are either crowded or have gaps in them along the gumline can become a breeding ground for harmful bacteria. In certain cases, crooked teeth can actually be a symptom of a problem with your jaw. Temporomandibular joint disorder (commonly referred to as TMD or TMJ) is a painful condition where the TMJ (a joint that acts much link a hinge) fails to move smoothly. Think about it like a door that doesn’t fit perfectly and drags on the floor a bit when you push or pull on it; that’s quite painful when it’s going on between your mandible and temporal bone! If your gums frequently have the appearance of being swollen, angry, or inflamed, it’s time for a visit to the dentist to see what is going on, as these are potential signs of gum disease. This is the first stage of gum disease commonly characterized by gum inflammation and plaque buildup. Catching gum disease at this stage is important, as it can be reversed with minimal treatment and a solid oral hygiene routine. At this point, your teeth are (unfortunately) permanently damaged. Now, this doesn’t mean you can’t take an active approach to minimizing your damage and it doesn’t mean that more advanced treatment, such as dental implants, aren’t a great option for you. When you see someone who has lost several teeth or has several teeth that are yellow/brown, loose, and soft, they are likely in the advanced stage of periodontitis. At this point, your teeth will likely need to be removed and replaced with dental implants, a fixed bridge, or some other similar treatment. Also, your teeth shouldn’t bleed when you brush them (it could happen on occasion, but it definitely should be the exception, not the rule)! You can learn more about how we help patients with gum disease by visiting this page. If your bad breath is more than just, “Oops, I ate some onions,” then you could have chronic bad breath (known as halitosis). There are many conditions that could cause halitosis and poor oral hygiene is certainly one of them. If someone you love or care for is constantly telling you that your breath doesn’t smell great (and offering you some chewing gum), it’s time to get the issue checked! We’re not saying you have to eat like a triathlete, but your diet does play a significant role in your oral health. For instance, eating too much sugar can create a breeding ground of harmful bacteria in your mouth that can lead to decay. Another example is dark cola or coffee. While the occasional dark drink shouldn’t hurt your teeth much, drinking them day after day can stain your teeth. If you are going to drink dark colas or coffee, we recommend drinking them through a straw so they can bypass your teeth and gums (for the most part). If you avoid sugar and dark-colored drinks it can go a long way to keeping your mouth healthy and in good shape! A rock solid oral hygiene routine isn’t difficult to find or master, but consistency is the key. At Shining Smiles Family Dentistry, we tell our patients they should brush their teeth twice a day for a period of two minutes each time and floss once daily. It’s also a good idea to supplement with mouthwash. Also, many patients enjoy using an oral irrigator or water flosser to reach some of those stubborn spots that only water can reach. Again, the routine is easy; become disciplined to follow it day after day without exception. Also, if you have a young child we recommend that you monitor their oral hygiene until they are at least 8 years old. While you want to encourage a young child to learn how to “do it themselves,” parents should still watch to ensure they are doing it correctly. So what should you do if you’re experiencing any of these problems? If you are experiencing any of the above problems and feel that your mouth isn’t as healthy as it should be, it’s time to see a different kind of dentist! At Shining Smiles Family Dentistry, Dr. Mohip focuses, not only on providing patients with the best treatment for them, but has an overarching philosophy of preventative care. Once we correct the issue you are experiencing, we’re going to share with you a personalized care plan to help you keep your teeth and gums healthy and happy for the rest of your life. Don’t forget– your oral care is extremely important to your overall health and wellness. Give our Powder Springs dental practice a call today to schedule your consultation! Are you a KSU student, but you’re not from the area? If so, you’re probably trying to find a few great places to eat, where you should get your haircut, where to go for fun and entertainment, and so on. The Kennesaw area is a great place to go to school and as you probably already know Kennesaw State is quickly becoming one of the biggest and brightest universities in the state of Georgia. While you’re probably busy with school, work, friends, and extracurricular activities, it’s important that you don’t overlook a very important aspect of your health while you’re in college…your oral health. Yeah, yeah, we know you’re on your own and you don’t want to hear a lecture about how you’re supposed to brush your teeth and floss every day, but just following a few basic rules can ensure you come out of school with a degree and all of your teeth still white, bright, and healthy! While this sounds innocent enough, it’s a dangerous line of thinking that can lead to gum disease, stained teeth, and bad breath. You see, it’s important to brush your teeth before you go to bed, as your mouth is a breeding ground for harmful bacteria. By brushing before you go to bed, you remove most of the bacteria that would otherwise slowly but surely destroy your teeth and gums. Flossing is one of those simple habits that people of all ages struggle with. As a college student, now is the perfect time to make flossing part of your daily oral hygiene routine and it takes less than 60 seconds. If you keep your floss right beside your toothbrush, you’ll be more likely to take the extra 45-60 seconds to floss your teeth and get rid of those fine food particles that brushing can miss. If you’re over the age of 21 and you’re drinking responsibly, we aren’t here to tell you to stop. Speaking strictly from an oral healthcare perspective, tea, dark colas, coffee, and alcohol can have a negative impact on your oral health. While it’s okay to enjoy some of these beverages in moderation, water is the best thing you can drink to ensure your body is adequately hydrated and your dental health is in excellent shape. So next time you’re at the store, grab a pack of water instead of a pack of soda! Sugar can have a devastating impact on your teeth and gums. One way to keep your mouth healthier is to limit your consumption of sugary foods and beverages. If you eat healthy, drink plenty of water, and chew sugar-free gum (if you’re a gum chewer), your body (including your mouth) will thank you for it. Without mom or dad around you may find there is nobody to give you an honest opinion about your breath and you don’t want to be the person walking around campus with foul breath! Mouthwash is another line of defense against harmful bacteria, gum disease, and of course, bad breath. I know you’re a college kid on a budget, but mouthwash is not very expensive and one quick 30-second “swish” per day can go a long way toward fighting gum disease and bad breath! As a college student, going to the dentist often gets put on the back burner. You don’t want to go to the dentist when you go home for the holidays or a long weekend, but at the same time you haven’t tried to find a dentist near Kennesaw Statethat you like. Find a dentist near your school that you like. This way you can have a routine dental appointment on a quiet Wednesday afternoon when you don’t have class. You’ll get the dental care you need and won’t have to worry about seeing a dentist when you go home for a break. If you’re a Kennesaw State student or parent of a KSU student, we’re not far away! At Shining Smiles Family Dentistry in Powder Springs (just a little outside of Kennesaw), we’re only about 10 miles from the KSU campus and it’s an easy drive. Dr. Mohip and the rest of the team at Shining Smiles are a group of fun individuals who enjoy making patients laugh and smile (many of our patients think of us as family)! If you’re a student looking to book an appointment for yourself or you’re the parent or guardian of a KSU student, we are currently offering a $99 new patient special! To learn more, give our practice a call or contact us right here on our website to get more information. We look forward to meeting you and helping you take care of your teeth while you’re living your college experience! Are you self-conscious about your smile? When talking to people or posing for a picture, do you try to “hide your teeth” and do the all gums smile? We get it. When you don’t feel confident about your smile, it can really eat away at your self-esteem, and no one wants that. For many patients who have lost the beauty of their natural teeth over the years, it can be a truly jarring, humbling experience. At Shining Smiles Family Dentistry in Powder Springs, we want to let you know that just because your smile isn’t what you want it to be now, doesn’t mean you can’t restore both the aesthetics and functionality of your teeth! Below, we’re going to discuss some of the most common questions we get regarding dental implants, because we want to equip you with the information you need to make the best choice regarding your dental health. 1 What are some signs I may need dental implants? At Shining Smiles, Dr. Mohip and our entire team always do a thorough exam and evaluation to ensure you’re a good candidate for dental implants. After all, we want to match every patient with the procedure that we feel is right for them (and that you’re comfortable with, of course). You may be researching a lot of different options on how you can restore your teeth as well as your smile, and maybe you’ve already read through a lot of information on dental implants. You’ve already had a lot of dental work done (cavity fillings, crowns, etc. ), but it’s been a long time and that work seems to be failing at this point. You’re missing several teeth, and as a result, you no longer have the ability to chew certain foods or smile like you want to. You have several teeth that are beyond being saved, and thus need to be extracted and replaced with a better, permanent solution. Your missing or damaged teeth are starting to have an effect on your face. You may notice that your face has a sunken look because you do not have teeth to support it. There are much more, but those are just a few of the ones we see when talking with potential implant patients. 2 Are they an effective solution for missing or damaged teeth? While there are other solutions out there, dental implants are universally considered to be one of the top treatments available for replacing missing or damaged teeth and restoring your smile. As we mentioned earlier, one of the factors that influence the success or failure of dental implants is ensuring you are in fact a good candidate and proper planning. In some cases, patients don’t have enough jaw bone for an implant to fuse with (a process called osseointegration), and as a result, a bone graft may be required. 3 How long do they typically last? Dental implants themselves (which is the titanium screw that serves as an artificial anchor for your new crown, bridge, or denture restoration) will typically last a lifetime. Obviously, your natural teeth didn’t last a lifetime, so it’s possible that your restoration won’t either. Dental crowns typically last 10-15 years (depending on how well they are cared for), and are the most likely component of an implant to need replacing years down the road. That being said, replacing the cosmetic portion of your restoration with new crowns will not be nearly as involved as the original placement of your dental implants. 4 What does the process of getting implants involve? You discuss your options with Dr. Mohip, and decide whether or not you are a candidate for implants (note: you certainly don’t have to decide immediately of course, but you’ll have the information you need at this point to make an educated decision). If you decide to move forward, an appointment will be scheduled for any needed extractions, and your implant(s) will be placed. After healing (with can take a few months) your abutment and crowns, bridge, etc. are placed to finish your restoration. You’ll walk out feeling great with the ability to eat anything you want and smile big! If you have any questions about any particular portion of the process, Dr. Mohip will be happy to answer! 5 Do they hurt? Is the placing of dental implants painful? We’re not going to stand here and tell you that you will not have any soreness or discomfort, but when most people ask this question, they are referring to the actual process of getting dental implants. At our practice, you’ll be under sedation the entire time, so you won’t feel anything immediately before, during, or after the procedure. It’s a commitment we make to all of our patients to keep them comfortable from the minute they walk in our office until they walk out. Of course, being under sedation you shouldn’t drive, so you will need to arrange for a ride to and from our office on your surgery day. 6 Which cosmetic restorations are typically used alongside dental implants? The dental implant itself is just the titanium screw that secures to your jawbone to mimic your natural tooth root. So, a question we get asked frequently is what cosmetic restoration will be used to “cap off” my full dental implant procedure? At Shining Smiles, we’ve had great results using crowns and bridges, which are artificial teeth that are carefully crafted in a dental lab to mimic the look of natural teeth. In fact, most people cannot tell a difference due to advancements in crown and bridge technology over the past 20 years. 7 Aren’t dental implants expensive? How can I pay for them? It’s no secret that dental implants aren’t cheap, and they can easily cost several thousand dollars. While you may be thinking “I can’t afford that right now,” we offer financing options that help make your dental care affordable with low monthly payments. After all, you probably didn’t pay cash for your last vehicle; you likely financed it. We’ve partnered with CareCredit, a healthcare financing company who can help you get the dental care you need, without having to come out of pocket several thousand dollars. You get the dental care you need, are able to set up low monthly payments, and CareCredit pays our practice for the services we have provided you; everyone wins! Would you like to take the next step, and get more information on dental implants? We’re conveniently located in Powder Springs GA (near Lost Mountain), in close proximity to Hiram, Kennesaw, and the Northwest area of Atlanta. If you would like to schedule your dental implants consult with Dr. Mohip, please give our office a call today! Remember…you don’t have to live your life being self-conscious of your smile, or not being able to chew the foods you love. We offer affordable payment options, and can get you on the books for a dental implants consult with Dr. Mohip soon. Give us a call to schedule your appointment. Do your teeth feel sensitive or fragile when you’re drinking a hot or cold liquid, or brushing your teeth? Tooth sensitivity is a common issue that adults and children face, and the causes can be numerous. If you find yourself struggling with tooth sensitivity, fear not! We’re going to share with you 8 possible reasons why your teeth might be sensitive, as well as offer a few solutions for what you can do to get rid of this nagging, frustrating, and sometimes painful problem. It only takes the smallest crack or fracture to cause incredible pain or sensitivity. In many cases, you won’t be able to see that you have a cracked tooth, but if a particular area of your tooth or teeth is always sensitive, then it’s definitely a possibility. If your tooth is cracked, visiting the dentist to get a filling or sealant is likely your best of course of action. In some cases, if a tooth is actually decaying, it could be that an extraction and tooth replacement will be necessary. If you notice any change in your gums, you should see a dentist immediately. At Shining Smiles in Powder Springs, we recommend our patients schedule a routine oral exam and cleaning every six months as part of their preventative maintenance. 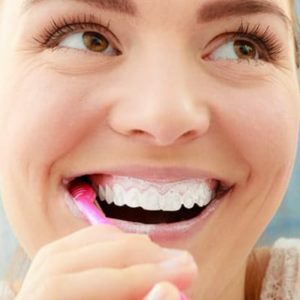 While whitening toothpaste may keep your teeth whiter, they can actually cause sensitivity (if you have ever had your teeth professionally whitened, then you may know this feeling all too well!). Did you know there is a scale that actually measures the abrasiveness of whitening toothpaste? It’s called the RDA value, and any toothpaste that is 100 or higher in the RDA scale is considered highly abrasive. So if you have recently switched toothpaste, and have just recently started to experience tooth sensitivity, you could be using a toothpaste that is too abrasive for you and may need to switch back to your old toothpaste or find one that is lower on the RDA scale. When selecting a toothpaste, whitening isn’t everything, you also want one that is gentle and healthy for your gums! Dental decay or weak tooth enamel could be the cause of your tooth sensitivity. When your teeth begin to decay, it can damage the nerve roots, which in turn can lead to that feeling of sensitivity when you eat, drink, brush or floss. Do you feel like you need to brush extremely hard to get every last bit of junk and bacteria off of your teeth? If so, you may be an aggressive brusher, which can actually do more harm than good. Brushing twice a day and flossing daily is a great habit, but you shouldn’t be bearing down or have to use any force when you do. Brushing slowly and gently twice a day for two minutes, and then flossing once a day is exactly what you should be doing to take care of your teeth (and visiting the dentist every six months, of course). Acidic foods can lead to tooth sensitivity because over time they can erode your tooth enamel. Without sufficient tooth enamel, more nerves are exposed, which can then lead to an increase in sensitivity. ●	Soft drinks. Colas are highly acidic, and while never drinking any soft drinks may be unrealistic, limiting your consumption is a good idea. ●	Acidic fruits. Fruits such as oranges, lemons, limes, and grapefruits (amongst others) are highly acidic and can lead to tooth enamel erosion. While fruits are healthy, they could be contributing to your tooth sensitivity and should be eaten in moderation. ●	Tomatoes. Tomatoes are delicious and healthy, but highly acidic. In addition to fresh tomatoes, tomato sauce or paste can also be acidic and may need to be limited. When you schedule your appointment with Shining Smiles and meet Dr. Mohip, she will be happy to discuss how you can improve your diet to decrease your tooth sensitivity. Teeth grinding is another potential cause of tooth sensitivity. In many cases, grinding your teeth that be a symptom of an underlying problem like temporomandibular joint disorder (TMJ). You’ve probably noticed throughout this article a common theme; when your enamel become compromised, it often leads to tooth sensitivity. This is definitely true with acid reflux, as chronic reflux can, over time, damage your tooth enamel leading to increased sensitivity. While you should see your primary care doctor regarding your acid reflux or GERD, we also recommend that you follow a diet that is conducive to lowering reflux. We can diagnose your tooth sensitivity, and get you on the path to recovery! With our knowledge and advanced technology, the team at Shining Smiles can diagnose the reasons why your teeth are sensitive, as well as provide you with a game plan for getting rid of it. If you’re in the Powder Springs area, or anywhere near Hiram, Kennesaw, or the surrounding area, give Shining Smiles Family Dentistry a call today! While the team at Shining Smiles are some of the biggest advocates you’ll ever find of keeping your natural teeth healthy, sometimes brushing, flossing, and regular dental exams aren’t enough to give you a perfect smile. After all, the shape of your teeth (and to some extent the color) aren’t things that you can easily control. If you already have a general idea of what veneers are, but are looking for a more detailed explanation of the actual process involved in getting veneers, you’re in the right place! Also, if you happen to be anywhere in the Northwest Atlanta area near Powder Springs, Hiram, Kennesaw, Marietta, etc. then Dr. Shaila Mohip would love to meet you and discuss whether or not veneers are a good treatment option for you! We’re not here to sell you veneers. We’re here to tell you what you need to know to make an informed decision. If we didn’t tell you the good and the bad, we’d be doing you a disservice. eneers can fix a wide variety of dental issues including chipped, cracked, stained or broken teeth. The veneers procedure is minimally invasive and almost completely painless. It’s not a complex surgery like when getting dental implants. Veneers can be created with very precise, scientific measurements and laboratory technology so that the color and shade of your new veneers come out exactly as expected. The process is relatively quick and can dramatically improve your smile and overall self-confidence. Veneers are not the cheapest option. If you’re on a tight budget, financing is available through Care Credit. We also offer cosmetic dental bonding for patients who only have a slight issue that needs correcting. Veneers are irreversible. Since removing a slight amount of tooth enamel is required, veneers are considered to an irreversible dental procedure. Dr. Mohip and the rest of our incredible team at Shining Smiles are very honest and transparent regarding any procedure, and are happy to discuss any additional questions or concerns you have regarding veneers. Our goal is for you to feel completely comfortable with any form of dental care before moving forward! You can research porcelain veneers until you’re blue in the face, but nothing can replace a sit-down consultation with an experienced cosmetic dentist like Dr. Mohip. You’ll get the opportunity to meet Dr. Mohip (after all, it’s important that a dentist and patient get along, like each other, and are a good fit to work together), ask her questions about other similar cases she has done, and get any questions or concerns you have answered (and we expect you to ask questions! It’s a part of the process!). Dr. Mohip will also give you a thorough examination to ensure that you are a good candidate for porcelain veneers, as well as discuss any other relevant options that may be better suited to what you’re looking to accomplish with your smile. If you would like to book your consult with Dr. Mohip, just call our office (770-766-7473). If all goes well at your consult, and you decide to move forward with veneers, then Dr. Mohip will shave off the precise amount of tooth enamel required to ensure your veneer will fit nicely over your tooth. The amount removed may be just a little thicker than an egg shell or a contact lens, and usually will not be more than 1/16th of an inch (in many cases, less than that). Each patient is different, so how much enamel removal is required will depend on your unique circumstance. Each veneer our patients receive are custom made by an off-site dental lab using high quality, dental grade porcelain that is light, thin, and strong. In order to get that perfect fit, we have to take a precise impression of the teeth your veneers are going to cover. We place a thick paste into a tray, and then place the tray over your teeth snugly and securely to ensure a defined impression for the dental lab. Both the teeth you are getting veneers over and the surrounding teeth will be in this impression. The turnaround time is typically pretty quick, and you’ll receive a temporary veneer(s) until your actual, custom made veneer arrives a few weeks later from the dental lab. One of the most fun parts for the patient and the dentist is “designing your new smile.” This involves selecting both the color, shape, and ideal translucency of your new veneers. A key component of a great cosmetic restoration is ensuring the finished result looks natural. This is why you don’t just go for the whitest veneer you can find. Sure, you want beautiful white veneers, but they need to mimic the natural color, shape, and translucency of perfect teeth! Dr. Mohip will show you pictures of veneers, as well as go through a “color wheel” that helps you to select the perfect shade for you. This is pretty straightforward, but important nonetheless. Before you leave our office (immediately after some of your enamel has been removed), we will bond a temporary veneer to the front of your tooth or teeth. While it’s not the finished product, it will still look great, and you can continue to live your normal life until your new, custom veneers come in and are ready to be placed. Once your custom, permanent veneers come back from the lab, it’s time to place them! After your temporary veneer is removed, the permanent veneer (or veneers) will be placed. You and Dr. Mohip will both evaluate their shape, color, and fit to ensure they are exactly what you’re looking for. Once you and Dr. Mohip both approve, the veneers will be permanently bonded! In some cases, small modifications need to be made to a veneer once it comes back from the lab (such as a slight change in shape). If this is the case, Dr. Mohip will make the necessary changes, or send back to the lab if needed (although this seldom happens because we only work with the best dental labs in the country and their quality control standards are rigorous). Time for a Porcelain Veneers Consultation? Now that you know a little bit more about the process of getting porcelain veneers, is it time for your consultation? We know it’s a big step, and we know that choosing a veneers dentist in the Powder Springs area is a big decision. We want you to know that at Shining Smiles we never, ever pressure anyone during a consultation. It’s simply an opportunity to meet Dr. Mohip (and the rest of our team), discuss your options, and see if there is good synergy. You’ll never feel forced or obligated to do anything you don’t want to do, and there is never, ever a “hard sell” of any kind. So if you’re ready to get off the proverbial fence and take the first step toward seeing if veneers are right for you, give our practice a call today, or contact us right here on our website!